Bank boosts market share in Asia-Pacific green bonds and raises activity in renewable financing in Asean. 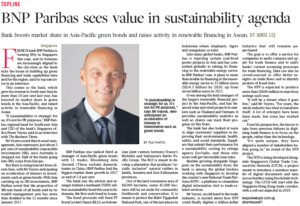 FRENCH bank BNP Paribas is turning fifty in Singapore this year, and its fortunes are increasingly aligned to the city-state as the bank ticks the boxes in building up green financing and trade capabilities here and for the region, said its top executive in an interview. This comes as the bank, which grew its revenue in South-east Asia by more than 10 per cent last year, has boosted its market share in green bonds in the Asia-Pacific, and raised activity in renewable financing in Asean. “It (sustainability) is strategic for us. 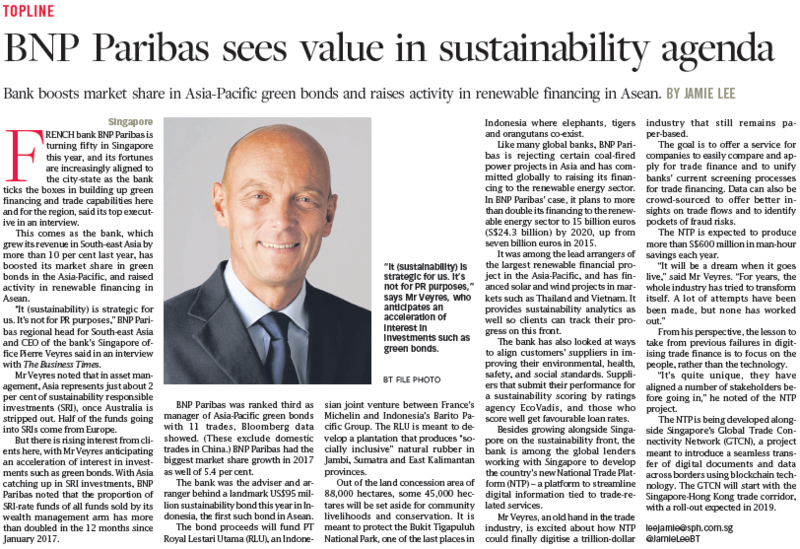 It’s not for PR purposes,” BNP Paribas regional head for South-east Asia and CEO of the bank’s Singapore office Pierre Veyres said in an interview with The Business Times. Mr Veyres noted that in asset management, Asia represents just about 2 per cent of sustainability responsible investments (SRI), once Australia is stripped out. Half of the funds going into SRIs come from Europe. But there is rising interest from clients here, with Mr Veyres anticipating an acceleration of interest in investments such as green bonds. With Asia catching up in SRI investments, BNP Paribas noted that the proportion of SRI-rate funds of all funds sold by its wealth management arm has more than doubled in the 12 months since January 2017. BNP Paribas was ranked third as manager of Asia-Pacific green bonds with 11 trades, Bloomberg data showed. (These exclude domestic trades in China.) BNP Paribas had the biggest market share growth in 2017 as well of 5.4 per cent. The bank was the adviser and arranger behind a landmark US$95 million sustainability bond this year in Indonesia, the first such bond in Asean. The bond proceeds will fund PT Royal Lestari Utama (RLU), an Indonesian joint venture between France’s Michelin and Indonesia’s Barito Pacific Group. The RLU is meant to develop a plantation that produces “socially inclusive” natural rubber in Jambi, Sumatra and East Kalimantan provinces. Out of the land concession area of 88,000 hectares, some 45,000 hectares will be set aside for community livelihoods and conservation. It is meant to protect the Bukit Tigapuluh National Park, one of the last places in Indonesia where elephants, tigers and orangutans co-exist. Like many global banks, BNP Paribas is rejecting certain coal-fired power projects in Asia and has committed globally to raising its financing to the renewable energy sector. In BNP Paribas’ case, it plans to more than double its financing to the renewable energy sector to 15 billion euros (S$24.3 billion) by 2020, up from seven billion euros in 2015. It was among the lead arrangers of the largest renewable financial project in the Asia-Pacific, and has financed solar and wind projects in markets such as Thailand and Vietnam. It provides sustainability analytics as well so clients can track their progress on this front. The bank has also looked at ways to align customers’ suppliers in improving their environmental, health, safety, and social standards. Suppliers that submit their performance for a sustainability scoring by ratings agency EcoVadis, and those who score well get favourable loan rates. Besides growing alongside Singapore on the sustainability front, the bank is among the global lenders working with Singapore to develop the country’s new National Trade Platform (NTP) – a platform to streamline digital information tied to trade-related services. Mr Veyres, an old hand in the trade industry, is excited about how NTP could finally digitise a trillion-dollar industry that still remains paper-based. The goal is to offer a service for companies to easily compare and apply for trade finance and to unify banks’ current screening processes for trade financing. Data can also be crowd-sourced to offer better insights on trade flows and to identify pockets of fraud risks. The NTP is expected to produce more than S$600 million in man-hour savings each year. From his perspective, the lesson to take from previous failures in digitising trade finance is to focus on the people, rather than the technology. “It’s quite unique, they have aligned a number of stakeholders before going in,” he noted of the NTP project. The NTP is being developed alongside Singapore’s Global Trade Connectivity Network (GTCN), a project meant to introduce a seamless transfer of digital documents and data across borders using blockchain technology. The GTCN will start with the Singapore-Hong Kong trade corridor, with a roll-out expected in 2019.